The gallery is proud to present a survey of paintings and works on paper. The show marks the twentieth year since the artist’s death. This exhibition comprises still life, interiors, and landscapes from over forty years of the artist career. Many of the works were painted in Gloucester, Massachusetts, where Blaine spent the summer of 1958, 1963, and 1971. In 1974 she acquired a house in Gloucester overlooking the harbor. Thereafter she divided her time between her apartment in New York and her cottage in Gloucester. The artist is most closely associated with the views from her studio windows. Her Riverside Drive apartment overlooked Riverside Park, the Soldier and Sailor Monument, and the Hudson beyond. She often painted still life interior scenes set against the window. Blaine is considered among the most exceptional colorists of her generation. Her paintings are a synthesis of the all-over mark making of 1950s abstract expressionists and the intimacy of Pierre Bonnard and Pierre Matisse. She translated nature employing calligraphic brushstrokes, coalescing into images, but never losing the integrity of individual lines. She was that rare artist who was masterful with oils and watercolors, and moved between them with great ease. Nell Blaine was born in Richmond, Virginia in 1922 and came to New York in 1942 to study with Hans Hofmann at his legendary Eighth Street School. 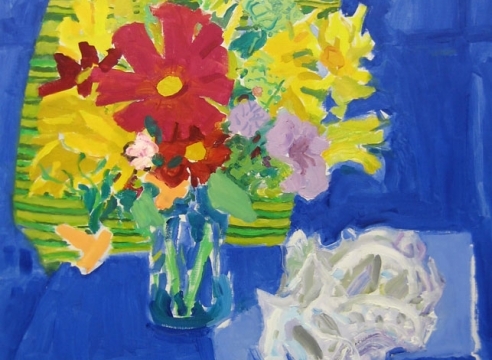 Her work has been the subject of well over one hundred gallery and museum exhibitions throughout the United States since her first show at the Jane Street Gallery in 1945. Her work is in the permanent collections of major museums including the Museum of Modern Art, the Whitney Museum of American Art, and the Metropolitan Museum of American Art, among many others. A monograph on the artist’s work was published in 1998.